On this trip we are going to visit the town of Rožnov pod Radhoštěm, especially the Wallachian open-air museum. This all-day trip is suitable for all admirers of timbered architecture which can be seen in this museum. Formerly a wooden little town, quaint and so typical, with the scent of old pine trees, of which it was built, spreads out on the banks of the Bečva river. At the beginning of 20th century people valued the special climate of this picturesque valley at the foot of the famous Radhošť mountain as an important spa region. 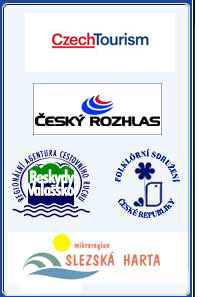 During the past decades Rožnov pod Radhoštěm has grown into an important tourist, cultural and industrial centre. The town, surrounded by sunlit meadows, blue mountains and sloping hills with the scent of blackberries and junipers has maintained its pleasing appeal. We will start our journey to Rožnov pod Radhoštěm from the Bystřice square. From here we will get to the Pod Platany street and continue further by the road no. 150 (Meziříčská) in the direction of Valašské Meziříčí and Rožnov pod Radhoštěm. In Valašské Meziříčí we go past the first traffic lights and continue straight on to the next traffic lights. There we turn right and after about 500 metres we arrive at the parking place by the "Mill valley" area. From here we walk to the "Wooden little town" area. The journey from Bystřice to Rožnov takes about 45 minutes. By bus: buses depart from Bystřice pod Hostýnem in the direction of Rožnov pod Radhoštěm rather irregularly and the journey would take 2 hours. Therefore we recommend to use railway. By train - trains depart from Bystřice pod Hostýnem every hour both on working days and weekends. In Valašské Meziříčí you must change for the train in the direction of Rožnov pod Radhoštěm. The connections are mostly concured. The journey takes about 1h 20 minutes and the ticket price is CZK 52,-. More information will be provided HERE. Make your visit to the heart of the Beskydy mountains a sweet memory for the rest of your life.